Executive Summary: “Smuggling of migrants is defined by Article 3 of the Migrant Smuggling Protocol supplementing the United Nations Transnational Organized Crime Convention (UNTOC), as ‘…the procurement, in order to obtain, directly or indirectly, a financial or other material benefit, of the illegal entry of a person into a state party of which the person is not a national.’ The specific nature of the sea-based component of the smuggling journey resulted in a dedicated section on the issue in the Migrant Smuggling Protocol. While smuggling by sea accounts only for a small portion of overall migrant smuggling around the world, the particular dangers of irregular travel at sea make it a priority for response; though more migrant smuggling occurs by air, more deaths occur by sea. The journey of the migrant smuggled by sea often starts a significant distance away from the coast of departure. Some journeys to the coast may take mere days, but others can take place over years during which the migrant must work en route to raise money for his passage. Arduous desert crossings and victimization by smugglers and other criminals en route mean that some do not survive overland journeys to the coast. Contrasted with these extreme experiences, economically empowered migrants can afford a higher level of smuggling service and may experience no particular hardship, simply travelling through various international airport hubs toward the coastal country from where their sea journey commences. The type and size of vessel used to smuggle migrants by sea depends on the time, place and financial capacity of migrants undertaking the smuggling journey. In some countries, boats of only a handful of passengers are commonly intercepted by authorities, while in others vessels of several hundred people have been used. While voyages may be comfortable when conditions at sea are mild and the vessel is equipped with adequate food, water and sanitation, the journey is a harrowing one for the majority of migrants who report rough conditions, terrible cold and scarce food and water. The nature of the crime and its relationship with smuggling of migrants by land and by air means that it is a successful crime type that yields high profits for smugglers with all the risks being borne by migrants. Indeed, migrant smuggling by sea can be understood as a criminal business, which is competitively run as such. Smuggling by sea is generally carried out by flexible criminal groups or individuals operating on the basis of repeated contractual arrangements, rather than by hierarchical organizations. There are two methods used when vessels approach coasts of destination. One aims to reach land by evading detection by authorities, the other sets out to be detected and intercepted or rescued by authorities in territorial waters of destination coastal countries. In both situations, detecting smuggling vessels at sea is a key challenge for coastal states which may have limited resources and large search and rescue areas of responsibility. Upon detecting vessels, the key challenge is to balance objectives with obligations at international law, including the Migrant Smuggling Protocol. Smugglers are generally well‐informed about states’ protection obligations and act to exploit them, instructing migrants what to do upon interception to increase their chances of gaining entry into and remaining in countries of destination. For instance, officials responsible for intercepting vessels at sea have been faced with situations of people sabotaging their own vessels to force authorities to carry out rescues. Suggestions made in respect of encountering migrant smuggling at sea include increased support of coastal states through joint patrols and provision of resources, and increased compliance with international legal standards and obligations in carrying out interceptions of smuggling vessels at sea. While responding to the situation at hand and ensuring that persons on board are appropriately assisted, a key challenge is to seize evidentiary opportunities to investigate smuggling‐related crimes. 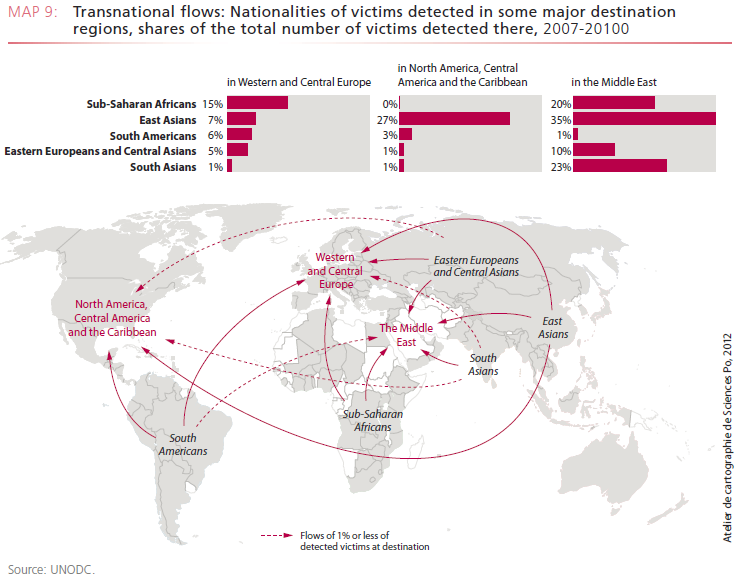 The complex nature of migrant smuggling networks and their modus operandi means that smugglers cannot be identified purely by looking to smugglers who may be on board boats; the transnational criminal network itself must be traced from a smuggling vessel, back to the coast of embarkation, and from there back to countries of transit and origin. Suggestions made for improved investigation and prosecution of migrant smuggling by sea include harmonizing domestic legislation with the UNTOC and the Migrant Smuggling Protocol. Further it is suggested that sentences imposed for smuggling offences be publicized as a means of deterring would-be smugglers. Capacity building measures are also suggested so as to increase identification of smugglers on vessels, and to better link sea-based crimes with land-based smugglers. Preventing migrant smuggling by sea requires states to balance their obligations in international law with their legitimate interests in protecting state sovereignty from violation by organized crime groups. But law enforcement efforts alone are not adequate to prevent migrant smuggling by sea; the Migrant Smuggling Protocol stresses that prevention efforts must address root causes that lead a person into the hands of smugglers in the first place. Suggestions made for preventing migrant smuggling at sea include raising awareness about the dangers of sea smuggling journeys and the criminality of smuggling. Suggestions are also made to raise awareness of those who influence political and policy decisions, so policies put in place protect state sovereignty, uphold international obligations, and are not vulnerable to exploitation by smugglers. Also emphasised is the responsibility of coastal states of departure to intercept smuggling vessels before they embark on sea journeys. Beyond this, comprehensive data collection, analysis and research are suggested to strengthen evidence-based responses. Experts from countries of origin, transit and destination unanimously agree that the most essential ingredient for effective and comprehensive response to migrant smuggling by sea is strengthened international cooperation to remove areas of impunity for smugglers along smuggling routes. Suggestions made for cooperating in response to migrant smuggling at sea include aligning activities with the Migrant Smuggling Protocol and increasing the role of UNODC in facilitating cooperative response. The value of bilateral and regional cooperation arrangements is stressed, with emphasis on flexible cooperative networks for effective and efficient on-the-ground response. Regular coordination meetings and joint operations are suggested to improve strategic and operational interagency coordination, as is the empowerment of central designated authorities to address migrant smuggling by sea. Click here for Issue Paper. Click here for UNODC statement. UNODC released a report on 30 May: The Role of Organized Crime in the Smuggling of Migrants from West Africa to the European Union. From the UNODC web page: “… The new report by the United Nations Office on Drugs and Crime (UNODC) investigates the involvement of organized criminal groups in the smuggling of migrants from West Africa towards the European Union (EU). The involvement of organized crime in the smuggling of migrants is a sensitive and controversial issue in West African countries, as the report discusses at various points. The publication contributes to better understand the underlying mechanisms and actors involved in this criminal process as a basis for policy reforms in countries affected. From the Report’s Summary: “The United Nations Office on Drugs and Crime (UNODC), through the European Union-funded ‘Law enforcement capacity-building to prevent and combat smuggling of migrants in the ECOWAS region and Mauritania (Impact)’, undertook to investigate the role played by organized criminal groups in the smuggling of migrants from West Africa to Europe. The present report is aimed primarily at decision makers, law enforcement and judicial officials, but also at a wider audience interested in irregular migration. It contributes to a better understanding of the underlying mechanisms and actors involved in this criminal process as a basis for policy reforms in the West African countries concerned. This report was prepared through desk and field research, conducted in Mali, Morocco, the Niger, Nigeria, Senegal and Spain. Interviews were conducted with over 200 people in Africa and Europe belonging to three main groups: migrants, national authorities and non-governmental organizations, and smugglers. • Transnational organized criminal groups are generally involved in the smuggling of migrants from West Africa to Europe. However, there are important differences among them in terms of specialization and professionalism. With regard to trafficking in persons and the smuggling of non-African irregular migrants, criminal groups are clearly well organized and structured, and keep close contacts with operatives in several countries. On the other hand, other would-be migrants in West Africa have to deal with loose networks that are not permanently structured. Various groups of actors usually collaborate for one particular operation, and there are no exclusive relationships between those criminal groups. • In most cases, smugglers are migrants themselves. Realizing that their knowledge acquired through (often painful) experience may be used by other migrants in exchange for remuneration, some migrants decide to enter the business of smuggling of migrants. They may then become specialized professional smugglers, or they use their knowledge to finance the completion of their journey to Europe. Click here for article on UNDOC web page. Click here for draft programme. UNODC has issued a new publication entitled “Smuggling of Migrants into, through and from North Africa: A thematic review and annotated bibliography of recent publications.” Most of the reviewed literature and data are from 2008 and earlier dates and therefore the publication does not include references to more recent events, e.g. the Italy-Libya migration agreement. But it is a comprehensive and useful publication. The 16 page Annotated Bibliography is a very good resource. Click here for link to Issue Papers.